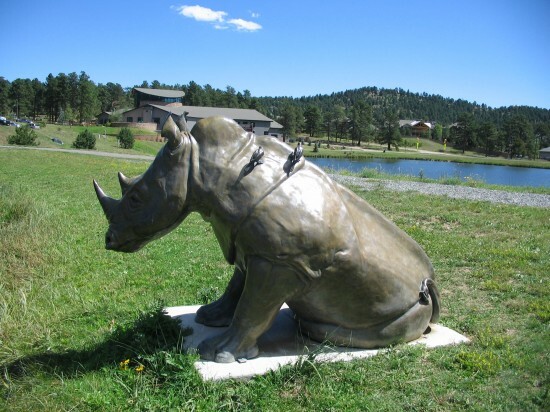 Being convinced that the rocky mountain rhino was rare, I was confident in the kitschiness of my first post when the sighting was made in Evergreen, Colorado. 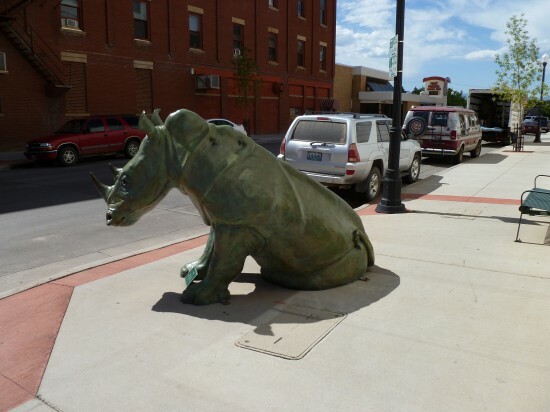 But to my utter amazement, this week I stumbled onto yet another one, this in downtown Sheridan, Wyoming. Of course I was sad to see that two of it’s 3 birds had been broken off at the feet. My findings make me believe that because in the Rockies they are so rare, one does have to assume they’re related by blood. While I was in Sheridan, I decided to take a little photo tour of the downtown area, hoping to find some interesting sights. Many, it turned out, were within 1 block of the new rocky mountain rhino find. 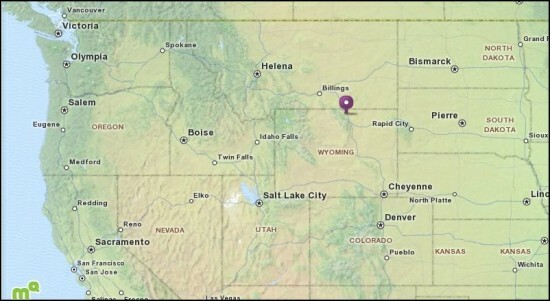 The purple marker on this map shows where Sheridan is. I was told the population is about 15,000. 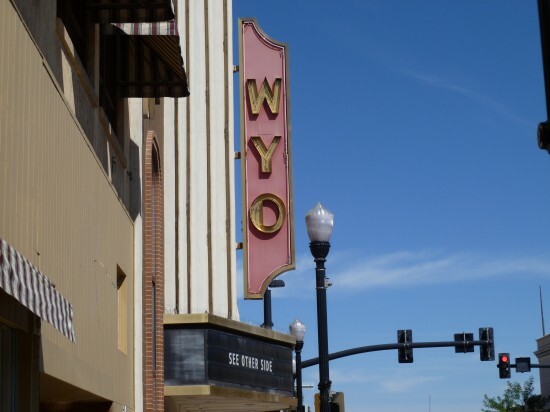 And there was the “WYO Theater, which I thought very cool. It opened in 1923. I was too timid to ask anyone if it was just short for Wyoming, or if it meant something else. 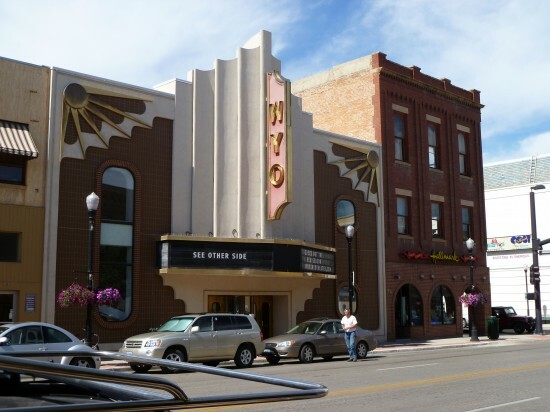 I loved the style, it’s been recently redone and is the venue for live theater in downtown Sheridan. Finally, and again, within one block of all the other attractions, sat a bar with one of the coolest neon signs I’ve ever seen. Love your tour. The reliefs at the top of the New York Store remind me of a great building on Highland in Los Angeles. I’m not sure of the name of it but it’s stark white like this one is, huge and on a corner and has big white bubble reliefs all over the entire building. The lofts look great. My favorite thing is that birdseye view of that gorgeous deco movie theater across the street. I’m guessing Wyo is, in fact, short for the state name. Have you ever been inside? That would make for a great individual post. Maybe I should push for The Color Purple to play there so we can get in. 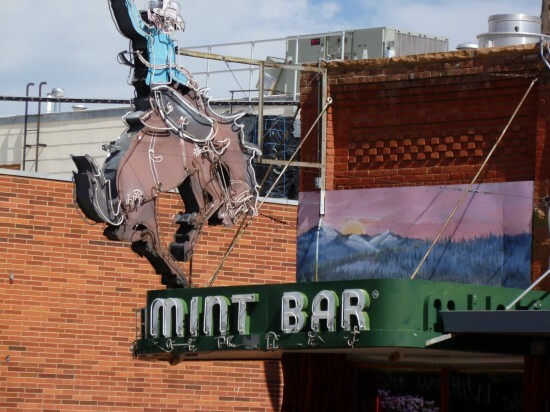 The Cowboy sign on the Mint Bar kills me. Love the Brokeback Mountain history. Of course, I always love these little adventures you take. Never been in the WYO. Never been to Sheridan before this trip. I’ll go back to Sheridan in the next year or so, and we’ll see if we can arrange for a photo tour of the WYO. 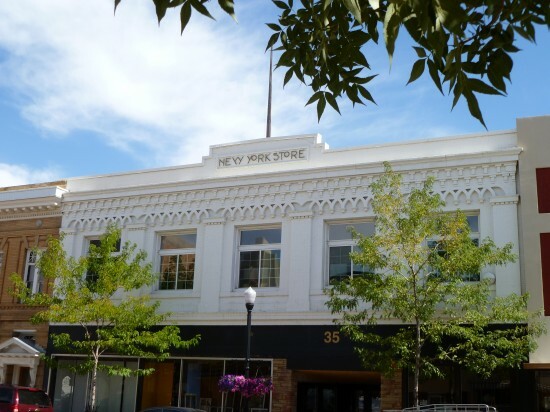 Great post, love seeing the architecture in Sheridan. Thrilled to see they are saving The WYO. The neon is wonderful, and such great contrast w/the Art Deco WYO Theatre, and the Cowboy Bar.